Could we understand 20th century art, not only by looking at artists and tendencies - but by also examining those moments when the art met its public, that is through, the history of the exhibition? Exhibitions can offer rare glimpses of both an aesthetic and a social milieu. The trappings of the exhibition - invitation cards, leaflets and most critically catalogues - embody an invaluable archival resource. They tell us not only about the scope of works on show, but who showed with whom, the graphic style of the day and styles of writing. Iwona Blazwick and Nayia Yiakoumaki in the preface of the reprinted catalog on occasion of the retrospective exhibition of the iconic 1956 'This is Tomorrow' exhibition, staged as 'This is Tomorrow (Revisited)' at Whitechapel Gallery, London, 2010.
based on documented exhibition data and offering a groundbreaking new perspective for art history. Art exhibitions are since many decades the #1 media to make artwork visible to the public, to reconsider concepts and styles, nationally as well as internationally. Since the end of the 19th century many exhibitions were groundbreaking and influential for the development of the different styles and concepts. See our selection in our blog post Influential Contemporary Art Exhibitions in the 20th and 21st Century, each with the complete list of participating artists, references to other exhibitions and related information. As a result, art exhibitions are archival objects in their own right, important indicators of perception and appreciation of art and artists at a certain point in time. Art exhibitions outline the profile of artists, galleries, museums, non-profit and collector's venues and curators. They are fundamental for self-understanding, branding, fundraising, future development, networking, public awareness, breaking new ground, finding new contacts, finding new clients. Group exhibitions are of particular importance to show the difference in the artist's individual profiles and to revalue their distinct position and concept. The structure of art exhibitions varies from solo exhibitions to large biennials, their focus may be presenting new art work, comparing different positions, focusing on a specific theme, giving a retrospective overview, accompanied by important texts and surveys. However, the access to exhibitions as an important source of information is very limited if not impossible without digitization. Digitization makes exhibition information searchable and indispensable to reveal its important value. In addition, artists, exhibition venues and curators are connected among each other through exhibitions. Each of them is reinforcing their profile through exhibitions. To better understand, explore and develop this important positioning artist-info.com is capable of visualizing the many thousands of exhibition connections among artists. By documenting always all participating artists of group exhibitions our visualizingartnetworks.com offers new, groundbreaking insight. Exhibition catalogs are an important resource for artwork, texts and research results. Making artist names, which are the key information of solo- and group-exhibitions, searchable across all exhibition venues and their exhibitions is a major benefit for research with artist-info.com. The relational structure among artists, exhibition venues and curators is used by artist-info.com to cross-reference all exhibition information. In libraries exhibition catalogs can only be searched by exhibition title/subtitle and the text authors, but not by their key content, the exhibited artists. By including exhibition catalog titles in its search results artist-info.com helps with the list of all participating artists of an exhibition to make library holdings searchable by the artist name. The common way is a one-dimensional structure: An artist or venue lists the solo- and group-exhibitions like on a piece of paper. In most artist biographies the other group-exhibition artists are missing. No search-engine finds this information. Without artist-info.com the artists of exhibitions can't be researched across venues and decades. The selected artwork and critical texts published in catalogs as well as the investigative work of curators vanishes with the time because of the missing digital access to the artist index of exhibition catalogs. artist-info.com is documenting exhibition histories in a multi-dimensional way on an interactive timeline to research with a mouse click the artist, exhibition venue or curator in this time line. The art world is very much fragmented. Nations concentrate on their cultural heritage, art museums are grouping among each other in favor to strengthen their profile, the success of galleries depends very much on their individual profile. Artists are strategically planning their career to may be having one day a solo exhibition at the MoMA. artist-info.com is documenting exhibitions across all these barriers and borders, from 1880 up to the present, worldwide, to make all elements searchable and visible. As venues are coming and going the artist remains for the art world the corner stone and anchor across decades. This was the reason to name our main page artist-info. We publish digitized exhibition information since November 1996 on the Internet, based on our database which we started in 1993. For artist-info.com an exhibition is an archival object in its own right: To identify an exhibition with an Id like on artist-info.com is the key to allocate the many different details of an exhibition, like artists, curators, artwork, critical texts, research results, quotation, and comments, to assign it to a specific exhibition venue. Documenting an exhibition starts with an index of the shown artists. Providing this key information is the focus of artist-info.com. The artist name is the first and most important search string in art research. Different to the cloud like result of search engines on many pages, documenting artists and their exhibitions with artist-info.com provides a most efficient access to exhibitions and their artists as key source of information and makes exhibitions and in particular their catalogs searchable, from the end of the 19th century up to the present, worldwide. Digitizing relational exhibition information provides like this new insight and enables together with other data, e.g. biographical, geographical, economic, sociological, network analysis and historical information new perspectives for research. As the exhibition catalog title is in most cases identical with the exhibition title the documented exhibition on artist-info.com can be found by its title through artist-info.com search result 'Exhibition Title'. The artist list on artist-info.com documents the catalog's artist index and exhibition catalogs become the first time searchable by the exhibited artists. This is an important advantage to find artwork and related texts of an artist. Digitization of exhibition information opens new perspectives for art history research. As digitized content is growing, securely identifying an artist by the name has become vital. The Thieme-Becker/Vollmer dictionary, published between 1907 and 1962 in 37 + 6 volumes, provides an unrivaled source for identification and artist biographies of earlier decades and centuries. Based on artwork in auctions is another source to identify artists and to find at least short biographical information. artist-info.com is a new pillar for art world research as it is based on exhibition information, which is not part of artist name dictionaries. artist-info.com proves to be a new authority file for artist names, based on secure and reliable information of exhibitions. 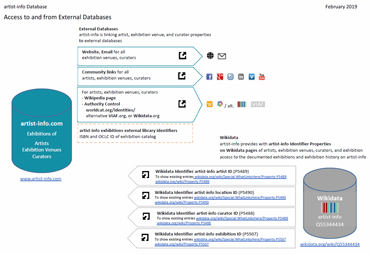 To complement an artist's, exhibition venue's, or curator's profile on artist-info.com we are adding whenever possible a Wikipedia page and WorldCat.org/identities/ page, which include authority control and VIAF information. To identify digitized data the authority files of libraries and archives worldwide summarized on VIAF.org are an important key index. However, VIAF.org and the many attached national (LOC, BNF, DNB-GND, RKD, etc.) or institutional (Getty ULAN®, wikidata, etc.) authority controls will never be able to cover this many names like artist-info is documenting through exhibitions and, accordingly, many artists names, exhibition venues, and curators will never have a VIAF Id.